What is a Connecticut Last Will and Testament? 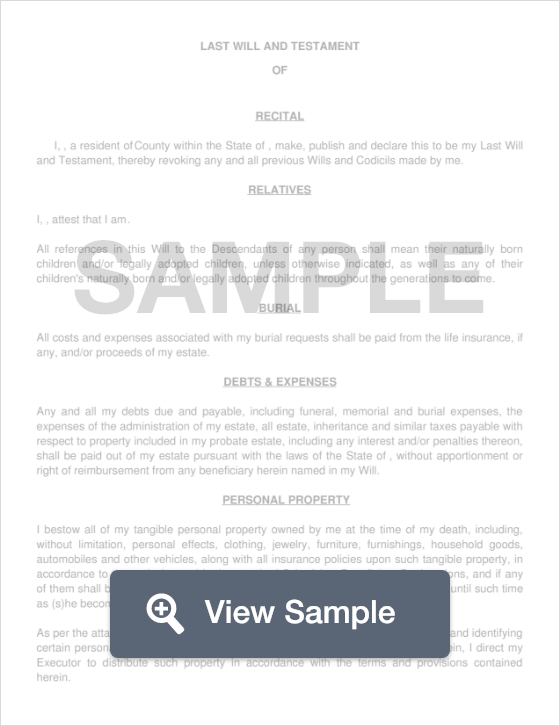 Connecticut Last Will and Testament: What Is It? A Last Will and Testament is a legal document that clearly expresses your wishes as to what you would wish to happen to your assets and belongings once you pass away. This document works to ensure that your wishes are met and that your beneficiaries inheritance is protected. According to state law, to be legally enforceable a Last Will and Testament must be signed by two (2) witnesses and must be notarized by a Notary Public. Last Wills and Testaments is also referred to as a “Last Wills” or simply “Wills”. Each state has its own set of laws, definitions, and signing requirements that relate to last will and testament documents. Below, these specifics are defined for the state of Connecticut. Witnesses - According to §45a-251, the Will must be signed by two (2) witnesses, or by a notary public or another individual authorized by law. Step 2 - Declare your marital status, as well as their spouse's name. (i.e married, single, engaged, widowed, divorced separated). Step 3 - Declare if you have any children, along with pets, property, or life insurance. If so, provide information on these details such as children and pet’s names, life insurance information and whether or not children will be named as beneficiaries. Step 4 - Specify how much in financial assets or what percentage of your assets will be inherited by each child. Step 5 - Specify whether or not you’d like to set up a trust for someone so you know that requires special care or has a disability. Setting up a trust for a person who needs special care or who has a disability can prevent any interference with their eligibility to receive Supplemental Security Income or other governmental benefits. Step 6 - State the age that your children will be when they may start receiving benefits from their trust, as well as the age they will be when the benefits come to an end. Step 7 - If you would like your body taken to a specific funeral home once you pass away, provide the name and address of this funeral home. Step 8 - If you have any specifications on the meal after the funeral service, list those specifics here. Step 9 - Name your Executor - Naming your Executor is important. If you neglect to name you Executor, the court may appoint one for you. Appoint your Executor by providing the following information of him or her. Additionally, if there is someone you do not want to act as your Executor under any circumstances, provide their name and relationship to you. Also, if you want to appoint an alternate Executor, provide their name and relationship to you as well. Similar to declining potential Executioners, if there is a person that the Grantor does not want to act as a Trustee under any circumstances, state the name and relationship this person has with the Grantor. Step 13 - Appointing a Guardian - If you have minor children and you want to appoint a guardian for them, provide their information below.